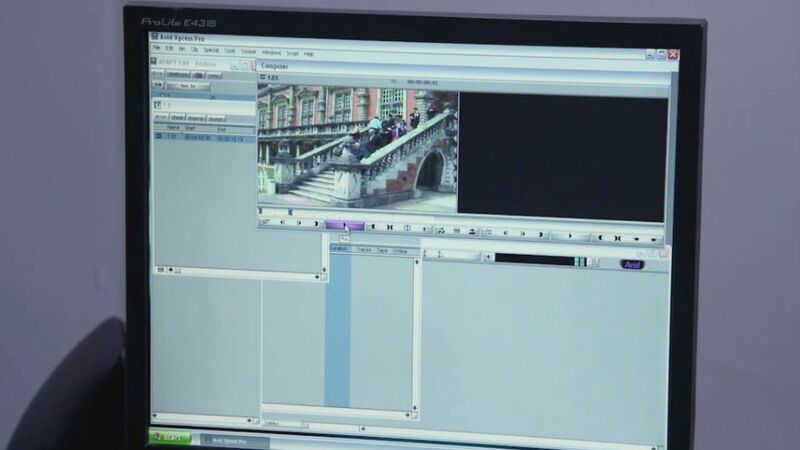 Avid Media Composer, first released in 1989, began a revolution in digital video editing. It enabled video editors to ingest compressed versions of shots and scenes from videotape to the hard disk of a computer, edit a video on a desktop, and then export the finished programme onto tape in a single pass. ‘Avid’, as the software soon became known, linked the intuitive flexibility of non-linear editing to the speed and portability of video tape. The features of its desktop environment – including separate windows for clip previewing and final edit, and a filmstrip-like timeline, imitated the layout of a flatbed editing table. At almost the same time as Avid, a similar software package – Lightworks – also appeared. The first Lightworks appeared in a London facility house in 1991. Later, other successful non-linear video editing software solutions like Adobe Premiere and Final Cut Pro were developed. Over the years these software packages evolved away from tape-based workflows towards full digital origination and editing. In the clips below, Avid editors Renee Edwards and Jonathan Brahman revisit an early version of Avid Media Composer from the early 1990s. Renee and Jonathan discuss the difference between the array of technology used for videotape editing, and the deceptively simple appearance of the desktop PC-based Avid. For Renee “it was just brilliant to be able to sit at a computer and work”. But Jonathan, whose background was in ‘online editing’, initially missed the Starship Enterprise-like array of machines that sat within an old-fashioned tape editing suite. Jonathan compares Lightworks and Avid, which came out at roughly the same time. Renee demonstrates placing a clip within a sequence: the basic building block of digital non-linear editing. Renee carries out some more complex editing tasks, demonstrating how shots and soundtracks can be lengthened or shortened within the Avid interface. In a tape-based workflow, the Avid edit decision lists were exported to a standard floppy disk which was sent to an online editor to ‘auto-conform’. This was the process by which the scenes selected by the Avid editor would be retrieved from the original tapes using timecodes, and automatically placed onto the final edit tape. These clips are drawn from a longer video of Avid editors Renee Edwards and Jonathan Brahman revisiting an early version of Avid Media Composer from the early 1990s.